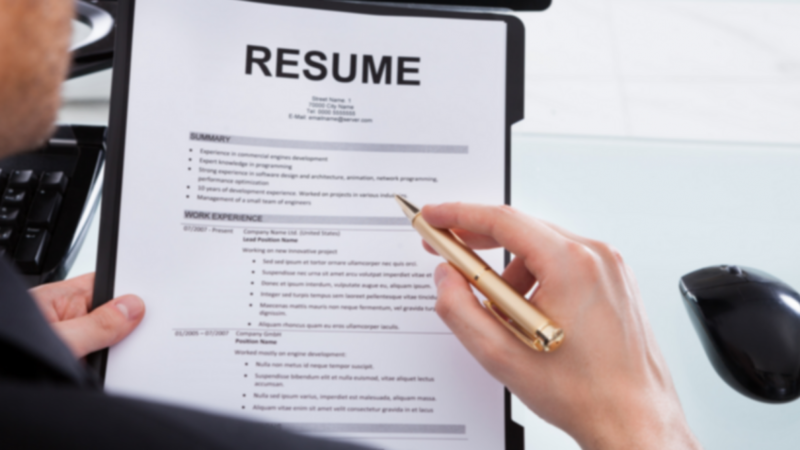 Your resume is the first impression you will give your potential employer. 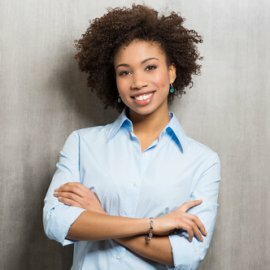 In an industry where organization and attention to detail are essential qualities, outlining your industry experience in your resume will help demonstrate that you are the right person for the job. Keep in mind that in this industry, technology is always evolving. 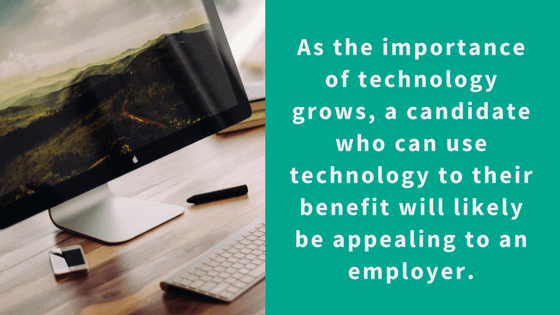 As the importance of technology grows, a candidate who can use technology to their benefit will likely be appealing to an employer as well. Start with a header. It should include your name, email address and phone number. Including this information at the top of your resume will help your potential employer contact you more easily if they need to. Choose a simple, easy-to-read, font and select an average font size. Size 12 is usually a good choice. A good goal for your resume length is one page. 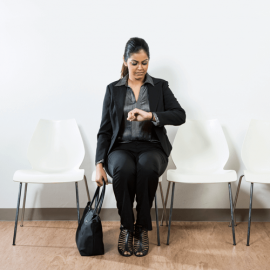 Employers read through a lot of resumes when searching for their perfect candidate, so it’s likely they might not have time to get past the first page. If you have a lot of experience, this might be a challenge, but do your best. If you find that you are having trouble, eliminate unnecessary and lengthy work. Less is more. If you absolutely cannot fit your resume onto one page, there is a rule that some go by which is to add an extra page for each additional 10 years of experience. But only do this if you must. Write a summary statement. The summary statement is a brief paragraph about your work history. Include your accomplishments and areas of expertise. You can also mention the type of position you’re looking to obtain. Do your best to make sure this section is well written, as it often is the first section that will be read. Create a timeline of your places of employment and the job titles you held. List them in order, starting with the most recent. Make sure to label the years you spent at each position and include your main job duties for each as well. Skills are an important part of a manufacturing resume. Make sure to include a skills section and showcase your prior manufacturing experience, especially if it relates to the job you are applying to. 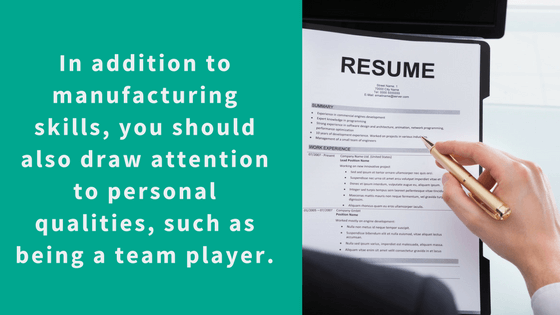 If your skills differ slightly from the job duties of the open position, still include them, because any manufacturing experience can be a plus and might prompt an employer to give your resume a second look. In addition to manufacturing skills, you should also draw attention to personal qualities, such as being a team player. In the manufacturing industry, you often have to work in conjunction with others. It’s important that the hiring manager sees that you show a strong value of teamwork. It is important to be a dependable employee, so do your best to give examples of your good work ethic as well. In many manufacturing positions, training, certifications and licenses may be required. Make sure to include your highest degree or diploma, your school and the year. Most importantly, include any licenses or certifications you have obtained for machinery or processes that would apply in the manufacturing field. This will set you apart from those who may not have the training required for a position. Recruiters are there to help you find your perfect career fit. 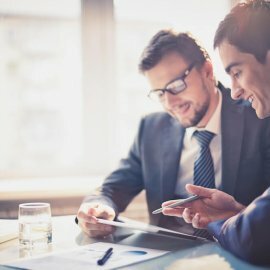 They have existing relationships with many companies and they know what skills the hiring managers look for in an employee. Use them as a resource! They can help coach you to make sure your resume is ready to put in front of a hiring manager. Need to find a manufacturing recruiter? Contact Alliance Technical Solutions, the manufacturing experts in staffing and recruiting.